We are offering Octagonal Blender to our clients. 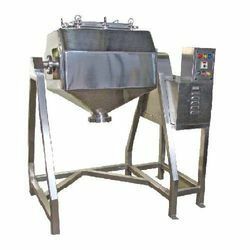 The unit is used for blending the most delicate & fragile free flow products like powder or granules in 10 to 20 minutes. It is also the best way to mix very heavy & abrasive products the range of products includes color, plastic, flour, drugs, pharmaceuticals, metal powders, minerals, fibers & many other. It is revolved over and over, moving the products in & out of the constricted octagonal areas. This causes multiple folding actions that ensures a thorough blending of all the ingredients in the batch. The result is a homogeneous blend regardless of particle size distribution, particle shape or density with a great efficiency. Looking for Octagonal Blenders ?